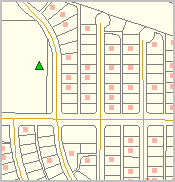 A census block group is a set of one or more contiguous census blocks sharing the same first digit of the census block geocode within one census tract. The block group geography is the smallest geographic area for which American Community Survey data are tabulated (5 year estimates).  Key in an address to find codes/names based on address. 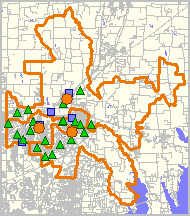 Block groups are geographic areas "sit between" census block and census tract geographic areas. 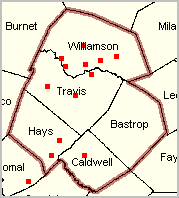 There are approximately 217,740 Census 2010 block groups and average 1,200 population in size. Block groups cover the U.S. from wall-to-wall. An important feature of census block groups is that they are the smallest geography for which decennial census and American Community Survey data are tabulated. 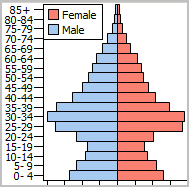 Their "hierarchical" structure makes it possible to aggregate subject matter data, such as the population of a certain age, to higher level geography including counties, metros, and higher level geography. 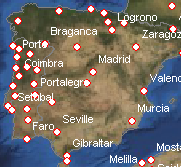 Block groups are statistical area geography. 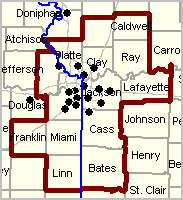 Boundaries and codes may be redefined for each decennial census. Census 2010 block group boundaries and codes will generally remain unchanged until Census 2020. There are a few exceptions. 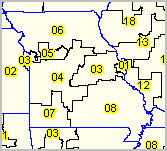 The codes used to identify block groups (BGs) reflect the basic census geographical hierarchy: the country is made up of states, states are made up of counties (and county equivalents like parishes and independent cities), counties are made up of census tracts, and census tracts are made up of census block groups. 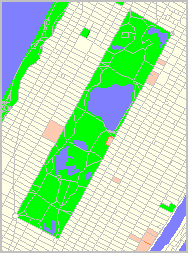 Even though a block group code only occurs once in each tract, it may be used again in another tract. Same goes for tracts in counties. A particular census block group within the U.S. must be identified by: its state code, its county code, tract code and its block group code (together the geocode). 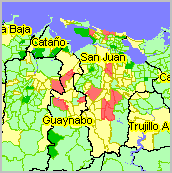  Block groups within tracts are identified by a 1-digit code. Combine these codes to uniquely identify a BG in U.S. (12 characters). For example, the BG containing the Office of the California Secretary of State, located at 1500 11th St, Sacramento, CA 95814, is uniquely identified by the code 060670011011. 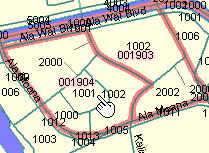 In the map views shown below the table, the address has been geocoded using the APIGeocoder and is shown as a red marker. BGs have a valid code range of 0 through 9. BGs beginning with a zero only contain water area and are generally in coastal and Great Lakes water and territorial seas, but also in larger inland water bodies. 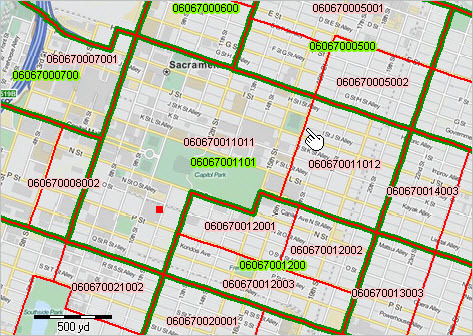 For the 2010 Census, a block group 0 for the water portion can be delineated in any census tract and not only those census tracts also defined to only include water area. This is a change from Census 2000, when block groups coded 0 only existed in census tracts with a code of 0. 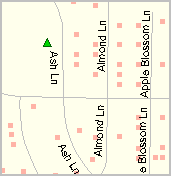 Block groups are labeled with red block codes. 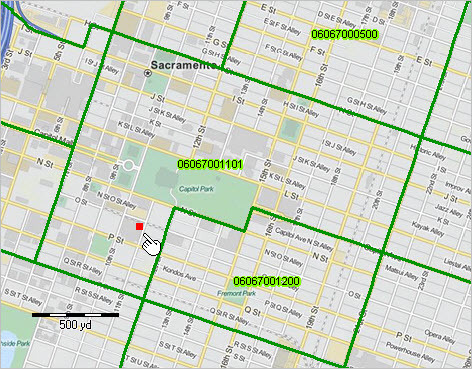 Tract 06067001101 is comprised of two block groups: 060670011011 and 060670011012. 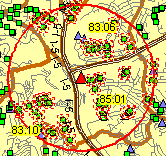 See pointer in map view; the block group within tract boundary.